As our readers already know, our team had to leave Kenya at the end of February, due to imminent and uncertain election times, to reach neighbouring Burundi where another Eurosha team was deployed. We have been here in Bujumbura for 3 weeks now, dealing with a few challenges in order to finalize remotely our Kenyan activities, but also having the chance of discovering a new environment and observe all the differences and common features between Eurosha Kenya and Eurosha Burundi. How to continue working on Kenya while being physically in Burundi? Fortunately before leaving we managed to complete all the field activities we had been planning since our arrival in Kenya. February, in particular, has been a busy month full of field mappings, trainings, meetings and other equipment management topics and decisions to take in the perspective of the departure (without forgetting the helpful presence of our HOT support during 3 weeks and the visit of our Desk coordinator from Paris!). Let alone some individual challenges like… packing without going over Kenya Airways luggage allowance after almost 5 months in touristic Kenya… hum. So field activities: checked. But our work does not stop here. Finishing and checking the data editing from our different field mappings on Java Open Street Map, following up partnerships with emails to send and feedbacks to prepare, creating communication documents out of our results, planning post-deployment activities… are all the kinds of tasks that need to be done if you want to close your project the good way and hope for its sustainability through feedback and tools transfer to partners. In addition to that, we also give support to the Eurosha Burundi team, in the middle of a rush period with a lot of trainings here and there and a coming departure to prepare, personally and professionally, as well. 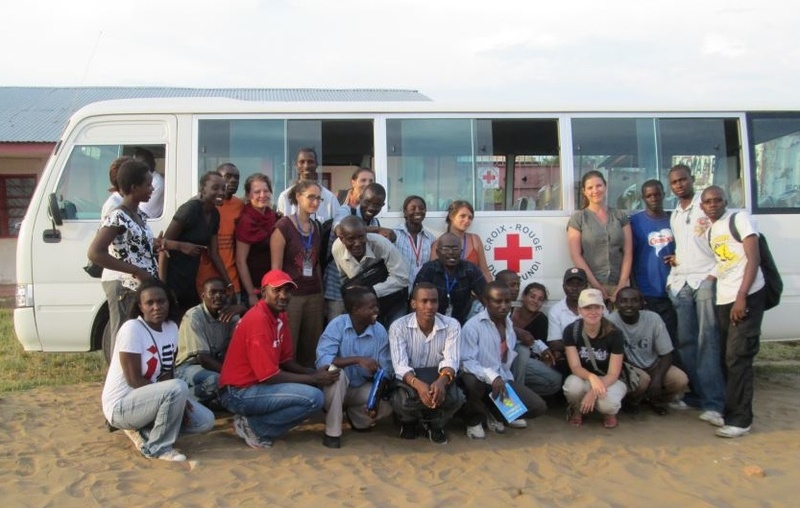 For example last week we joined them to deliver a training for the Burundian Red Cross Society with around 20 trainees in Gatumba, one of the capital’s district close to the Congolese border and prone to regular floods and water-related diseases. Third category of Kenya team activities in Burundi: common work lines. The end of the mission is coming for all of us; it is time for everybody to look back on the 5 months and a half we have been spending in Africa implementing the Eurosha project. Having the opportunity to be together already, Kenya and Burundi teams started working on common communication documents about our mutual results; a Volunteer’s guidebook for future European Aid Volunteers with tips and words of advice; and finally a capitalization booklet allowing us to keep a record of our experience and identify lessons we learnt in the field. While finalizing all these activities, we are also enjoying our new environment and discovering another economic and political context, local humanitarian topics, mentality, language (French class for a few of us! ), way of entertainment, etc.. For example since Kenya and Burundi are both members of the East African Community, it is of high interest for us to see and compare how this regionalism expresses itself here and in our initial deployment country. Let’s take a daily experience: in Burundi cars drive on the right side of the road but most of them have their wheel on the right side. Why? In the perspective of harmonizing driving regulations with the others EAC members in which people drive on the left (dated British colonial rule). A concrete example of regional politics affecting direcly people’s life! Finally, this “evacuation” experience will have taught us to be even more adaptable and enjoy the places we are as long as we are there, while keeping our goal in view: closing our field mission the best we can for our partners, Kenyans colleagues and beneficiaries and preparing for the return in our dear Europe.